Cottage garden September calendar. Thing’s to do in the cottage garden this month. September is the last month of summer it is time to begin preparing the cottage garden for autumn and now is the time to start planting spring-flowering bulbs. If you are growing herbs, vegetables or fruit it is harvest time and you will find yourself quite busy enjoying the fruits of your labours. If the weathers warm make the most of it and get those gardening jobs done before the colder temperatures set in. Temperatures vary all over the country and your garden will have it’s own micro climate so take that into consideration. You may need to adjust this September calendar a little for your own cottage garden but it’s a good place to start. September Calendar: Flowering Cottage Plants. Continue cutting back perennials that are fading. Divide herbaceous perennials. 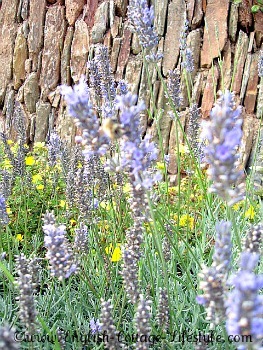 The end of September is a good time to plant new perennials as the soil is warm and damp. Collect and sow seeds from perennials, hardy annuals and sweet peas. You can sow sweet peas in a cold frame or the greenhouse for early flowers next summer. Plant winter and spring-flowering bulbs this month such as Narcissus, tulips, snowdrops, crocus, fritillaria imperialis, iris and lilies. Deadhead hanging baskets and keep watering. If your plants have seen better days plant spring-flowering bulbs and spring-flowering plants and remember to water your hanging baskets. Prune the old stems of rambling roses and make sure the new stems are tied back before the winds begin. Take cuttings of lavender, fuchsias, hydrangeas, rose, clematis, buddleia, and geraniums. Simply pull of the side shoots that have heels , remove the lower leaves and place in a good organic compost. Plant out your spring-flowering biennials, such as digitalis, viola and Erysimum. 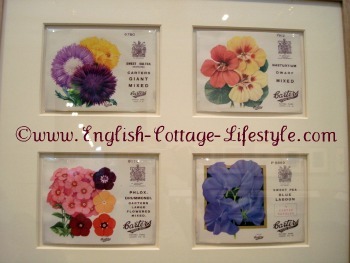 For more information on cottage garden biennials click here. 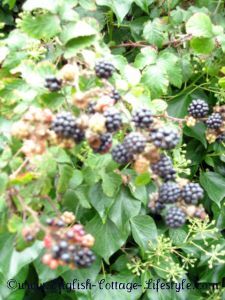 September is the month for foraging in the hedgerows. Now is the time to harvest blackberries and hedgerow fruit, other plants you can find in England’s hedgerows are elderberries, hips, sloes, haws and apples. Pick autumn raspberries and cut back canes. Harvest: apples, pears, plums, quinces. Cover leafy crops and protect autumn raspberries and blackberries with netting to protect them from birds. Plant the crops you want to eat later, such as: asparagus onions, pears, plums, radishes and strawberries. You can plant rooted runners from your own strawberries if they are healthy. When the foliage of asparagus turns yellow or brown cut all the stems to about 2-3cm then add an organic compost. September Calendar: General Cottage Gardening Jobs. Keep watering new plants and trees, reduce watering of household plants. Clean out cold frames and greenhouses so that they are ready for autumn. Start to remove shade/paint from the greenhouse to let in more light. Close ventilation early in the afternoon to trap in the warmth. If you bring in any new plants make sure they do not have pests or diseases. Clean up your cottage garden and do any repairs now before the cold weather begins. Now is the time to buy and spring-flowering bulbs and to collect seeds and beans for next year.